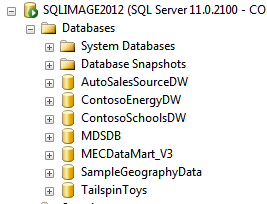 This entry was posted on May 23, 2012 at 6:41 am	and is filed under Business Intelligence, SQL Server. Tagged: msbi, training. You can follow any responses to this entry through the RSS 2.0 feed. You can leave a response, or trackback from your own site. Thanks for digging that out, I’ll sure give it a try – time to play with BI some more. Yep, every drive you setup with VirtualBox always gets setup initially as a SATA, so you always need to remove it and add it as an IDE. At least that is my experience. I’ve downloaded twice and received a corrupt ZIP file both times. How has anyone managed to get this running? Hi Dan – Did you manage to re-arm Office? 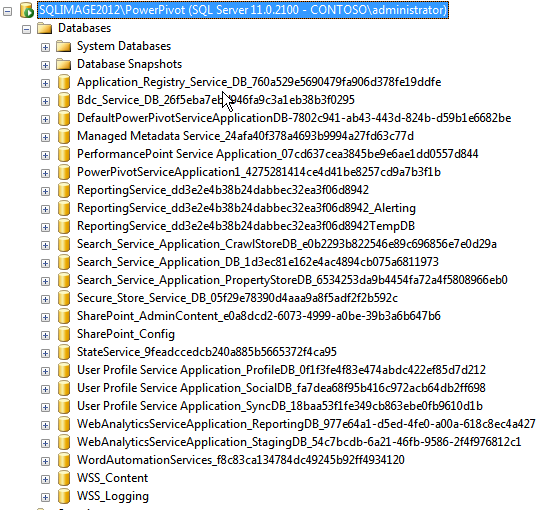 I have run the powershell script but nothing seems to happen..? I haven’t tried yet, but i have used this information to rearm Office previously on VMs for another 30-days (can be used up to 5 times to give you 180-days). Once you open up one of the Office apps you can simply click on the Cancel to activate your Office and you can continue the Trial. I was reading your blog entry about setting up the latest sales demo. of death within in the virtual image then it stops and tries to reboot again. the memory allocated to virtual image I still get the problem. and using http://sqlimage2012/SitePages/Home.aspx I got to the Demo Home page. cannot find site. I also get the same thing when clicking on all the power view reports too. The power view scripts open…but none of the power view or the Telco demos work. When using this with VirtualBox you need to make sure that when you add the hard drive that you set it up as a IDE instead of a SATA. By default it seems like VirtualBox sets them up as SATA, so you need to remove that one and then add it back in as IDE. 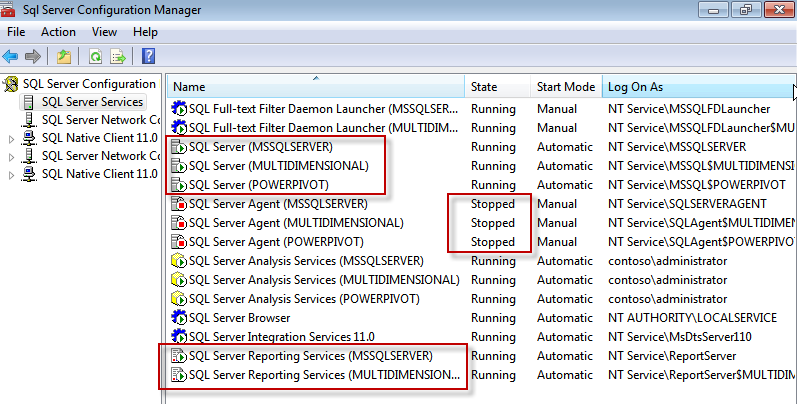 When using the Power View reports and the link sqlimage2012 you will need to update the Power View connections so that they are pointing to the proper connection file, so just using the manage data connections option and edit the entity source that is setup for them. However I am still struggling trying to repoint the power view reports to the proper connection files. The option is in the context menu of the Power View report. You will see the option called ‘Manage Data Sources’ and this will then take you to the EntityDataSource. Click on that and then modify the connection string to point to the proper URL. If you are in the PowerPivot gallery you will need to change the library view from Gallery to All Documents first so that you can access the context menu for the items in the library. Without a lot of memory this image is really not usable. You need to really manage the services that are running to try and free up any memory that you can. I think I may be facing an issue with memory but Im not sure as I have shutdown all he Hyper V services and others unnecessary services you mentioned. But I definitely cant launch the PowerPivot Gallery within Sharepoint. 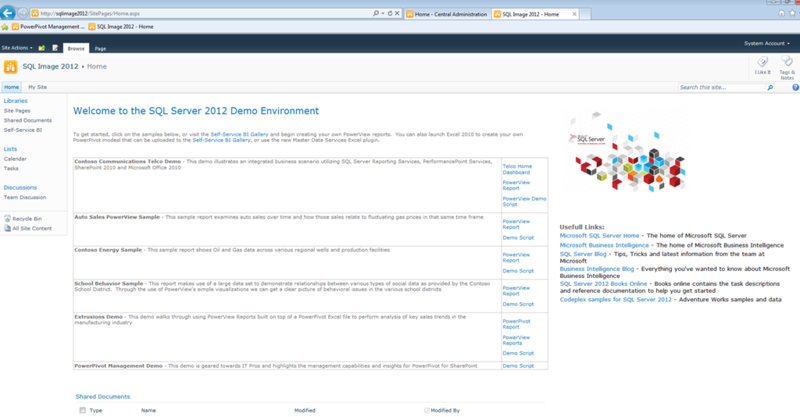 I start at the Self-Service BI page where it lists all the models associated with the demo page. When I try and click translucent icon “create power view report ” to invoke power view and and make the appropriate changes to the power view reports within the gallery. 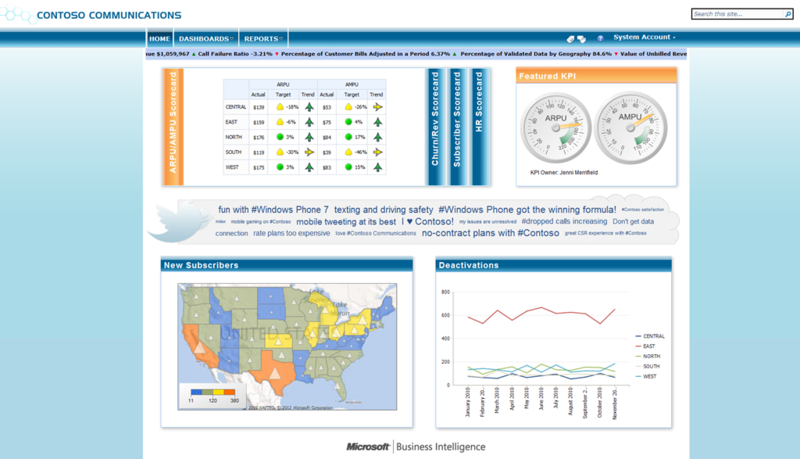 “The web application at http://sqlimage2012/SelfService BI/Auto Sales Model.bism could no be found. I try all the other models and i get the same issue. It is possible that another modification I made was to made a change to the Alternate Access Mappings in SharePoint Central Administration. When I look at that I only see two entries, one for http://sqlimage2010 and one for http://sqlimage2012:19559. So if you see the intranet contoso one you might want to either remove it or change it accordingly. Once you do that then maybe this will resolve your issue. That was the final piece in the jigsaw. Yes you have to remove intranet contoso url in the Alternate Access Mappings in SharePoint Central Administration and have it point to http://sqlimage2012/ instead. I’m not able to login with pass@word1 for administrator. I just tested out my image again and that is the correct password that you need to use to login. I have imported this VHD to Hyperv 2012 running on Windows Server2012 ..Does this effect anyway to login. That should not make a difference, still same account on the image. You’ve probably worked it out by now or given up, but for anyone else with password problems, try pass”word1 instead. If your computer is set to British like mine then the ” and @ keys are the other way round from US machines, so need to be swapped when typing on a virtual or remote machine in US format. 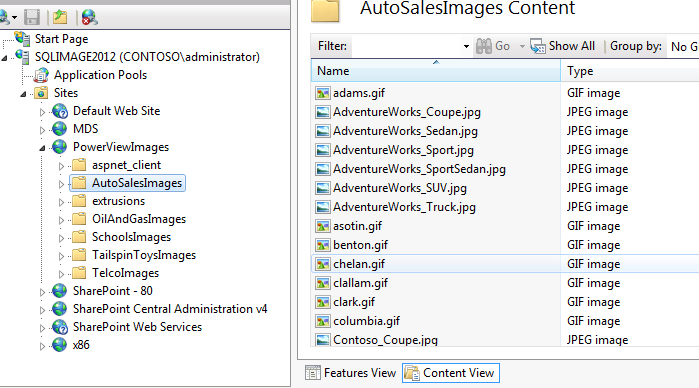 The item ‘http://sqlimage2012/SelfService BI/Auto Sales Sample Report.rdlx’ cannot be found. —> Microsoft.ReportingServices.Diagnostics.Utilities.ItemNotFoundException: The item ‘http://sqlimage2012/SelfService BI/Auto Sales Sample Report.rdlx’ cannot be found. Not sure, I have always downloaded and run the image, never tried using it online. I am very keen to install this VM and have a play around with all the latest toys. However, when I try to download from ‘http://www.microsoft.com/betaexperience/pd/BIVHD/enus/default.aspx’, I keep getting redirected to the Windows Server 2012 evaluation download page. I suspect this is due to me running Windows 8 on the machine I am trying to download to. I have actually seen the VM running on Windows 8, so am sure this will work. My issue is I just can’t download the damn file 😦 Do you have any advice how I might get round this, an alternate download location maybe? Is there any other alternate download location? MS should make a note either this is not available anymore or move to another else.